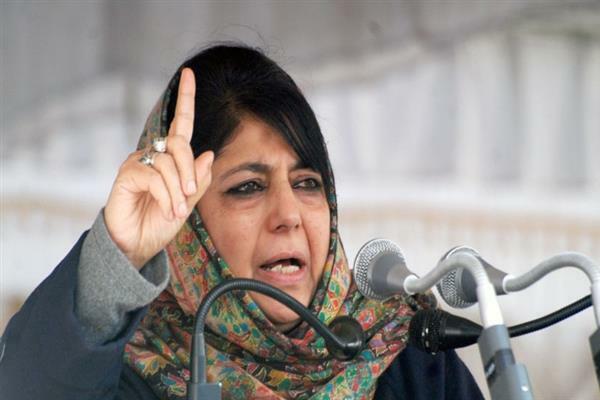 Srinagar: Reacting strongly to the remarks of Bharatiya Janata Party (BJP) president Amit Shah, Peoples Democratic Party (PDP) chief and former chief minister Mehbooba Mufti today said the day NDA-government revokes Article 370, India will be an occupational force in Jammu and Kashmir. “Dialogue with Hurriyat, revocation of AFSPA, safeguard of Article 370, talks with Pakistan and separatists and return of power projects. You accepted and signed all these conditions,” she said. Amit Shah had said that abrogating Article 35-A was the party’s commitment to the people of the country. “It has not happened till now as we do not have a majority in Rajya Sabha, but I believe it will happen by 2020. Removing Article 35A has been in our manifesto since 1950, it is our commitment to the people of the country,” Shah had said at the News18 Agenda India Summit. Mehbooba reminded Amit Shah if at that time you had accepted all the conditions, now why are you beating the drum of repealing Article 370. PDP chief asked Amit Shah the day you will revoke article 370 from Jammu and Kashmir “you will become an occupational force in Jammu and Kashmir”. “You will lose all your rights in Jammu and Kashmir,” Mehbooba said in her fiery speech.